Snack dish for you and your family enjoy your morning tea coffee..it can be varied anytime with leftovers sabzi. Make your own version today. Take the bread and brush little oil on it. Keep the oil side below on a sandwich maker and stuff the potatoes mix on it. Now cover it with bread and brush oil on top. Cook them for time suggested on different sandwich makers. 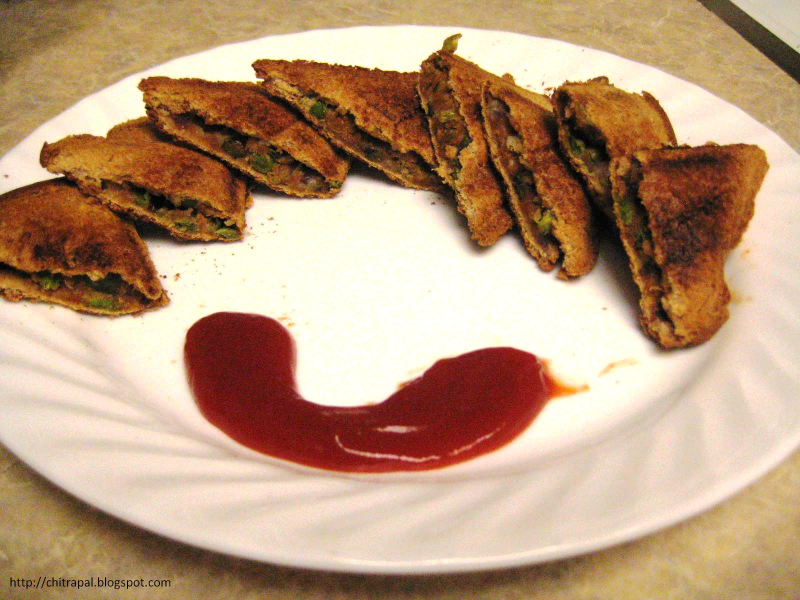 Cut them diagonally and Serve with tomato sauce. No no you dont have to chop them. If you are using fresh peas it's even better than you dont have to thaw them also. I used frozen as fresh was not available that time. Thanks Chitra for replying. Please tell me do I have to chop the peas as well? Hi Chitra what is thawed peas?